The interior design scene is seeing a major resurgence of wallpaper of late, and we couldn’t be more excited about it. But make no mistake: this isn’t your grandmother’s wallpaper featuring the dated prints and heavy finishes of decades' past. Instead, the modern wallpaper trend is all about geometric patterns and fresh shapes full of satisfying symmetry. And the best part about it is that there are a ton of different ways to incorporate it so it's suitable for any and every style sensibility. You can opt for a small but bold statement wall, you can paper your entire home floor-to-ceiling, or you can incorporate the ever-popular removable wallpaper that you switch and swap with the changing seasons. The point is, the wallpaper possibilities are endless. And the spaces below will give you all the inspiration you need to make this trend your very own. You don’t need much of this trend to make a big statement. Opting to wallpaper a recess or small wall in your home will add dimension to your design without overwhelming it. The natural texture of organic materials like wood and rattan make a perfect complement for the texturized patterns modern wallpaper brings to a design. So if you’re looking to revive an organic space, look no further. If you tend to steer clear of bold patterns in general, there are plenty of soft and subtle ways you can incorporate this trend, like in the case of this sweet home office. Another great thing about wallpaper is its capacity to define a space. If you have a hallway or entryway that you’re not quite sure what to do with, consider papering the walls for a definitive, layered style. A great way to play with this idea is to match geometric patterns around the room for a look of polished cohesion. These golden triangles shine that much brighter against the contemporary triangular bedspread. While vibrant, striking patterns are great options for wallpaper, so, too, are softer and more neutral prints. The pattern here adds just the right amount of visual intrigue without overtaking the design. If you’re like so many of us who are working with less than ideal square footage, adding prints to your small space will give it plenty of style without the cramp and clutter that added decor can bring. Few spaces call for creative stimulation more than your office. 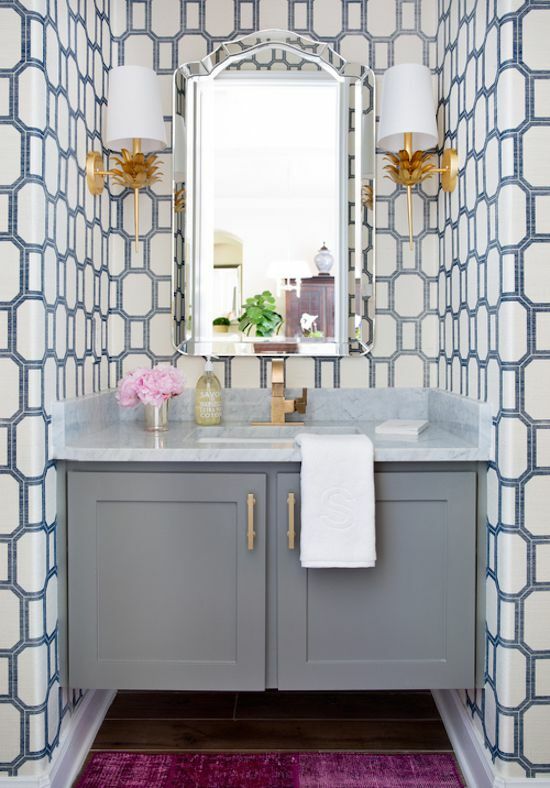 Adding geometric wallpaper to this area in an energizing pattern will give you all the creative stimuli you need to make it through your afternoon slump. Okay, so technically this isn’t wallpaper, but the effect of these stick-on triangles in candy-coated colors is the same, if not better. If you’re not up to the task of papering your entire space, a few of these stickers will transform it in much the same way for a fraction of the time. A lot of us aren’t lucky enough to have an entire room to designate as a work space. If that sounds like you, then meet your new style solution. Adding wallpaper will function to define the boundary of your office, giving it a polished and inviting vibe.